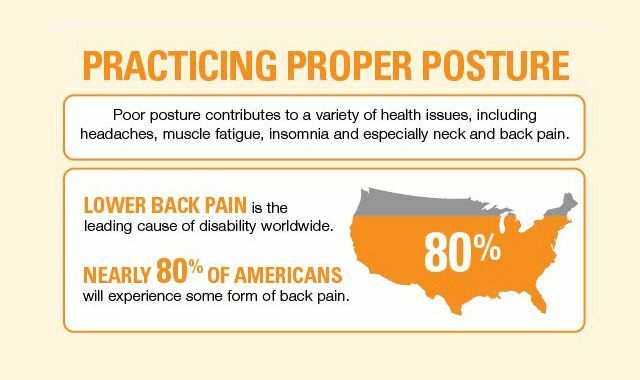 Practicing Proper Posture #infographic ~ Visualistan '+g+"
Are you hunched over a computer all day or slouched in your seat during rush hour? Up to 70% of people spend over 6 hours a day sitting down. Poor posture not only affects the way you look, it can lead to harmful health problems such as headaches, tension, soreness, insomnia and even neck and back pain. When the back is straight, the spine is supported and stabilized, but as your posture worsens, your spine does not have the support it needs to stay balanced, leading to an increase in health problems. This misalignment along the spinal column disrupts nearly all major components of the spine and even your internal organs. In fact, lower back pain is the leading cause of disability worldwide. Get out of that slump! Discover signs of poor posture and the long term effect it can have on your entire body. Straighten up your back with this how-to guide for perfect posture and best practices to prevent lower back pain.